These past 6 months have been the most amazing of my life. Bimmer is my world. She is my heart. She is my soul. She is my everything. I never knew what I was missing until I met her and held her for the first time. Yup... I am a total sap. A mushy pile of goo when it comes to this amazing little girl. This week, she got to see Santa (she did so well) AND she gets to go see her family in The Fort. I packed some baby sweet potatoes for her to eat while the rest of us chow down. 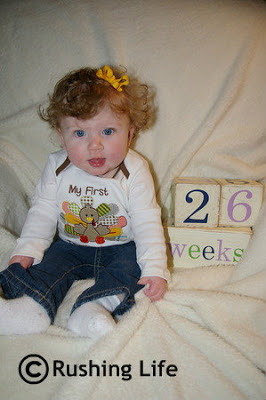 I cannot believe how fast these past 26 weeks have flown by. I just know the next 6 months will go just as fast. So we better hang on to every moment as best we can!